I wanted to add walnut accents to the the oak back on my rocker. The vertical accents on the back slat was set in 1/8” slots, it was my second attempt and the result was less than I wanted. It was difficult to get a clean fit. The oak slot was very difficult to get edge clean I’m guessing that the flat sawn oak and going with the grain caused the splintering and rough edges.The horizontal accents were attached with epoxy and much easier. My questions are, what can I do to get a clean fit and if I have to use epoxy to attach the strips will it hold and can it be an acceptable solution ? I’m not clear on exactly what you are doing and how you went about it. Are you inlaying or overlaying (surface mounting) the accents? If inlaying did you use a router and template? Why are you using epoxy over regular wood glue? Filling gaps with a color matched wood putty would be better than epoxy. If a router is the culprit with the splintering, perhaps using hand chisels would prevent that issue. At least deep scoring the profile of the accents before routing should help make for a cleaner cut. When I do inlay I make the accent piece first, set the accent piece on the work piece score around the accent piece with a razor knife or xacto knife. I use a sharp pencil to highlight the score lines I rout up close to the score line but not touching it clean up to the score line with a wicked sharp chisel test fit the accent piece if everything looks good add glue and with a caul beat it into position. This is very close to what I did for the vertical slat except I used a chisel to form the recess and maybe my marking knife needs sharpen. It look as if the score lines followed the grain. I will spend the time to make sure my chisel is sharp also. 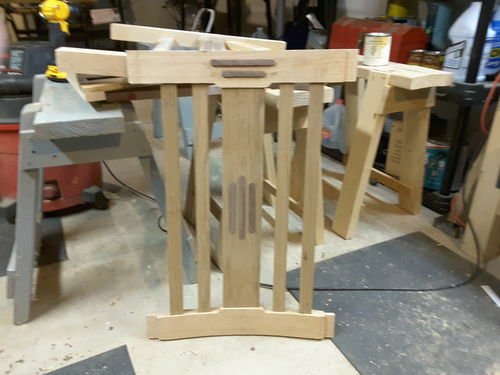 When I expoxied the accent piece for the top I spread it on the part and clamped it to the top without making a recess. I’ve had good luck with a router and edge guide. A solid carbide spiral downcut bit is your best bet.